These kinds of transfers are the least troublesome, but some precautions should be taken with them. 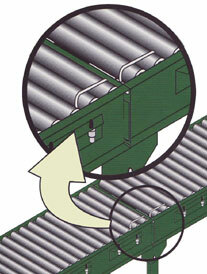 Small packages may hang up or tumble when transitioning from belt to belt, at the gap between the two conveyors. The larger the pulley, the wider the gap. A smaller pulley might or a nose bar might be required to address this issue. Small boxes may hang up on un-powered gravity system and pop-out rollers. This typically requires an understanding of the minimum size carton that will be conveyed. Usually a power roller section will prevent these issues. Live roller conveyors provide the best transition since it's possible to power the end rollers with o-rings. During installation, it must be assumed that both conveyors are at the same level to insure a smooth transfer from one to another. 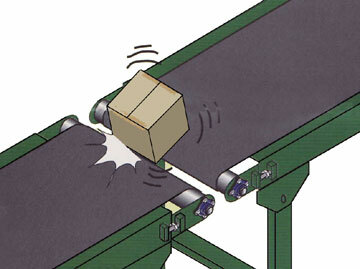 Without this, packages may catch as they transfer between conveyors. 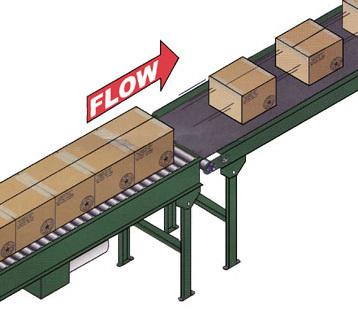 It's possible to speed up one conveyor to pull a gap or provide separation between cartons. 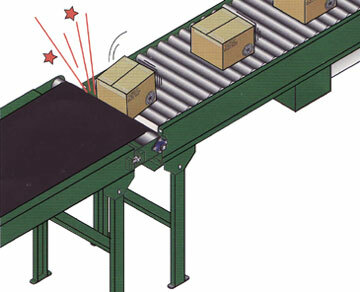 Separation might be necessary for sortation, stops/transfers, box counting, or to separate prior to a curve or incline. 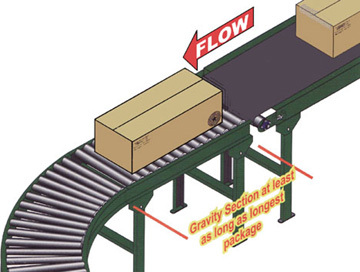 When transferring a package from a power conveyor to a gravity curve, a straight section of gravity conveyor at least as long as the longest package to be conveyed should precede the curve. This is recommended because the force of the belt may be greater than the force of the curve, resulting in the package overshooting the curve. 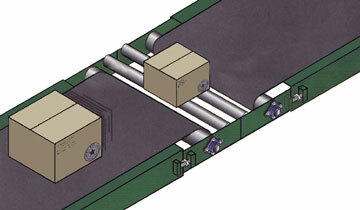 Power curves should also be preceded by a straight section of powered roller conveyor as long as the longest box. If boxes jam, it may be necessary to speed up the curve to compensate.